Some people are destined for greatness. Likewise, some Scotties are born to chase their wildest dreams - even if that means catching that elusive squirrel. Some people are so smart, they're considered geniuses. And some Scotties, well, let's just say they figure out where all the "hiding" spots so cleverly selected are...in 30 seconds flat. Some people develop complicated formulas and theories, giving others a whole new perspective on everything they thought they knew. Some Scottie masterminds devise seemingly impossible and inherently unpredictable schemes that leave their Scottie Moms wondering whether she really knew anything about rearing Scotties in the first place. Furthermore, some people excel in mathematics and I've never known a Scottie who couldn't add more treats to (and simultaneously, subtract treats from) his or her plate. Some people - namely, Albert Einstein - sported crazy hairstyles in his day. And for anyone who has ever woken up to see Mr. K's "bed beard," you know this a trend for a true genius. For Scottie Dad's birthday, we brought home a gigantic painting of this crazy-haired genius so Scottie Dad could feel like he had his say in the design of the new house. 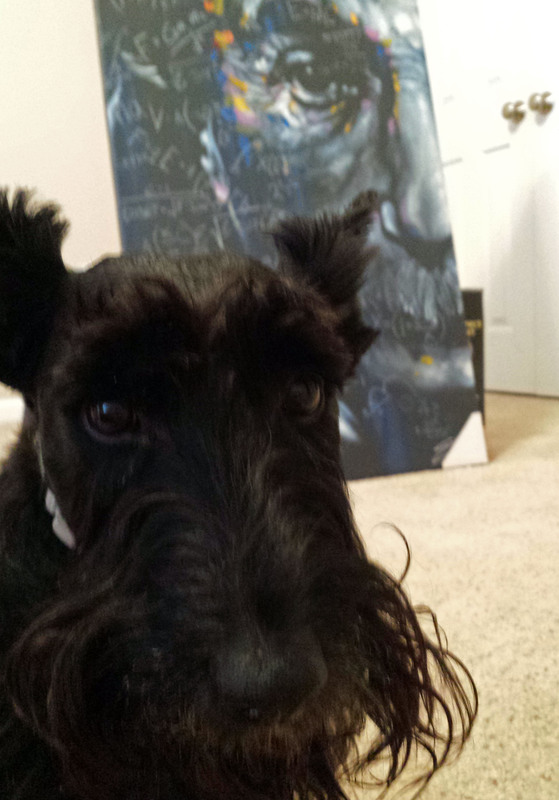 This gesture got Mr. K thinking: what does a Scottie have to do to get a giant portrait of his genius self painted for Scottie Dad to idolize? And so, there he sat in front of the painting - pondering this dilemma and gazing up at the strangely painted man with eyebrows eerily similar to his own. What did this man do that captured the lifelong admiration and respect of Scottie Dad? Then, the Aha! ArRRrOo moment happened. The answer was: E=mc2. The secret to Mr. K earning Scottie Dad's unwavering admiration and respect was coming up with a formula of his own that explained some super genius theory. Mr. K got to work. He came up with a few like p.u.=doo2 and zoomE > c2 that were close, but didn't quite make the cut. Finally, he came up with the ultimate formula for world peace, another of Einstein's goals: ScoT = <3. They know I know the "treat" word, so They call treats "t - r"s.
T.R.=love, peace, harmony and fun. That's my formula for success.